This attractive Grade II listed Victorian property is a townhouse style maisonette with its own ground floor entrance and a further three floors. The interior is beautifully presented with a well-proportioned sitting room with an attractive fireplace and tall windows opening to a balcony with outlooks over the famous Pantiles. The kitchen/breakfast room is very well fitted and equipped, as is the family bathroom with its wet room area with a shower. 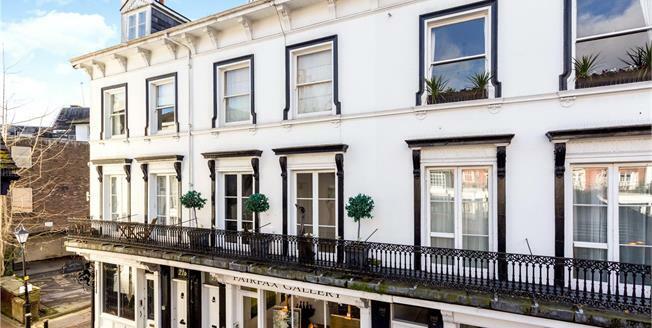 The bedrooms are on the two upper floors with two enjoying the very attractive outlooks over The Pantiles. This delightful property is set in the heart of the historic and picturesque Pantiles with its walkways, bandstand and colonnade of shops, boutiques, tea rooms, restaurants and pubs etc. Further on, there is a large Sainsbury’s superstore and close by, the open spaces of Tunbridge Wells Common. The High Street and mainline station are only a short walk away and in the town centre, at the Royal Victoria Place shopping precinct, there are many major national stores. The town is renowned for its educational facilities for children of all ages, including grammar schools for girls and boys and recreational amenities include a cinema complex, theatres, sports and leisure centre, two golf courses and numerous restaurants etc. Train Services: Tunbridge Wells mainline station for trains to London (Charing Cross, London Bridge and Cannon Street) in about 50/55 minutes. For car parking, this property is entitled to two residence parking spaces by application to Tunbridge Wells Borough Council.